Bike Carrying Case is perfect for train or bus travel when you are bringing along your bike or for storing your bike in your car apartment or boat. Worth your buying! 1. The bag is made of quality 420D polyester fabric, tear-resistant, durable, waterproof and lightweight, exquisite with fine craftsmanship. 2. The bag can be used to store 14-20'' foldable bikes for transporting bike by car which can prevent car from being smudged, can also work as a saddle or handlebar bag for storing water bottles or repair tools. 3. The adjustable shoulder straps are well woven and very sturdy and wearable, with a pad on it for comfortable use. 4. Two-way zipper design is good for putting bike into bag and store it, with a small zippered pocket outside for storing small items. 5. Useful and convenient to use, ideal for cycling lovers. QUALITY DURABILITY - Made of quality 420D polyester fabric, both bike carrying bag and saddle bag are tear-resistant, durable, waterproof and lightweight, exquisite with fine craftsmanship. 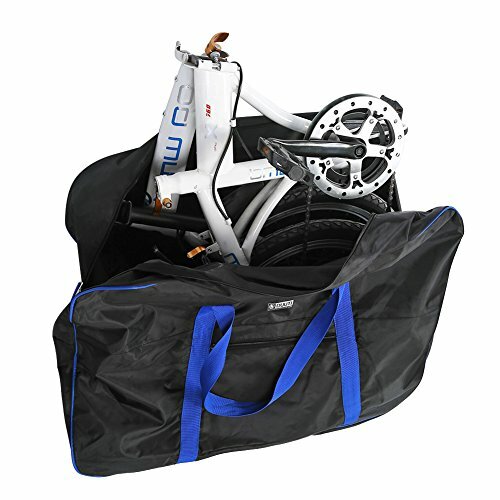 LARGE STORAGE - The large bag can be used to store 14-20'' foldable bikes for transporting bike by car which can prevent car from being smudged, can also work as a saddle or handlebar bag for storing water bottles or repair tools. CONVENIENT TO USE - Adjustable shoulder straps and pad on it for comfortable wearig. Two-way zipper design is good for putting bike into bag and store it, with a small zippered pocket outside for storing small items. BONUS - Also come with a saddle bag to attach on your seat for small tools storage. Such a practcial bargain, ideal for cycling lovers. GUARANTEE - If you are not satisfied with our product received, you can apply for unconditional return and refund in 180 days. In terms of any problem of this product, you can send emails to us at any time. We will be the first time to reply you.